I had two ripe bananas on the counter and with the cool weather we’ve been having I decided to turn the oven on and make banana bread. This recipe is from one of my mother’s many Iowa farm cook books and unfortunately I don’t have the originators name. I changed the mixing method a little bit to help lighten the texture and also added a tiny amount of vanilla. I love this bread because it is simple and you are not overwhelmed by any one ingredient. 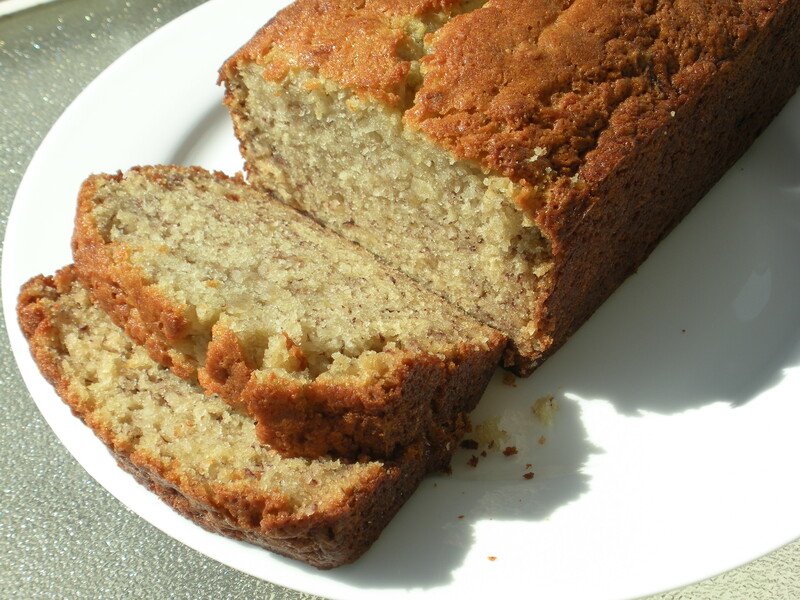 The butter is balanced with the banana and sweetness of the sugar to make a tender bread that reminds me of home. Enjoy! *You can make a quick buttermilk by combining 1 1/2 teaspoon of white vinegar into a measuring cup and fill with milk to the 1/2 c. line with milk to make 1/2 cup of buttermilk. Let it sit on the counter for 10 minutes allowing the vinegar to work its magic. Wipe the a loaf pan with the butter wrapper or spray with canola oil. Dust with flour if you are not using a non-stick pan. Combine the flour, salt and baking soda in a small bowl and stir with a whisk to incorporate. Combine the eggs and buttermilk in a small bowl and whisk to combine. Next add the dry and wet ingredients. Use a rubber spatula and begin with the flour mix, add 1/2 c. and mix until barely combined. Next add some wet and mix until just combined. Keep going until all of the wet and dry are combined. Pan and bake for 50 minutes or until the center of the loaf is barely firm. I tried a modified version of this last night in hopes of making it a little healthier. I used half a.p. flour and half whole wheat flour. I cut down the sugar and used part brown sugar. I also cut down the butter. The texture and flavor we great however it had a strange bitter after-taste. I think the acid from the buttermilk and acid from the brown sugar was too much. I’ll continue to modify and post later.